The United States is a federal republic in which the President, Congress and federal courts share powers reserved to the national government, according to its Constitution. The federal government shares sovereignty with the state governments. The executive branch is headed by the President and is formally independent of both the legislature and the judiciary. The cabinet serves as a set of advisers to the President. They include the Vice President and heads of the executive departments. Legislative power is vested in the two chambers of Congress, the Senate and the House of Representatives. The judicial branch (or judiciary), composed of the Supreme Court and lower federal courts, exercises judicial power. The judiciary's function is to interpret the United States Constitution and federal laws and regulations. This includes resolving disputes between the executive and legislative branches. The federal government's structure is codified in the Constitution. Two political parties, the Democratic Party and the Republican Party, have dominated American politics since the American Civil War, although smaller parties exist such as the Libertarian Party, the Green Party and the Constitution Party. Generally, the Democratic Party is commonly known as the center-left liberal party within the United States, while the Republican Party is commonly known as a centre-right conservative party. There are a few major differences between the political system of the United States and that of most other developed democracies. These include greater power in the upper house of the legislature, a wider scope of power held by the Supreme Court, the separation of powers between the legislature and the executive and the dominance of only two main parties. Third parties have less political influence in the United States than in other democratically run developed countries; this is because of a combination of stringent historic controls. These controls take shape in the form of state and federal laws, informal media prohibitions and winner-take-all elections and include ballot access issues and exclusive debate rules. There have been five United States presidential elections in which the winner lost the popular vote. Suffrage was the most widespread in the world, with every man who owned a certain amount of property allowed to vote. While fewer than 20% of British men could vote, a majority of white American men were eligible. While the roots of democracy were apparent, nevertheless deference was typically shown to social elites in colonial elections. That deference declined sharply with the American Revolution. In each colony, elected bodies, especially the assemblies and county governments, decided a wide range of public and private business. Topics of public concern and debate included land grants, commercial subsidies, and taxation, as well as oversight of roads, poor relief, taverns, and schools. Americans spent a great deal of time in court, as private lawsuits were very common. Legal affairs were overseen by local judges and juries, with a central role for trained lawyers. This promoted the rapid expansion of the legal profession, and the dominant role of lawyers in politics was apparent by the 1770s, as attested by the careers of John Adams and Thomas Jefferson, among many others. The North American colonies were exceptional in the world context because of the growth of representation of different interest groups. Unlike in Europe, where royal courts, aristocratic families and established churches exercised control, the American political culture was open to merchants, landlords, petty farmers, artisans, Anglicans, Presbyterians, Quakers, Germans, Scotch Irish, Yankees, Yorkers, and many other identifiable groups. Over 90% of the representatives elected to the legislature lived in their districts, unlike in the United Kingdom where it was common to have an absentee member of Parliament. Americans became fascinated by and increasingly adopted the political values of republicanism, which stressed equal rights, the need for virtuous citizens, and the evils of corruption, luxury, and aristocracy. In response to Hartz and others, political scientist Rogers M. Smith argued in Civic Ideals (1999) that in addition to liberalism and republicanism, United States political culture has historically served to exclude various populations from access to full citizenship. Terming this ideological tradition "ascriptive inegalitarianism," Smith traces its relevance in nativist, sexist, and racist beliefs and practices alongside struggles over citizenship laws from the early colonial period to the Progressive Era, and further political debates in the following century. At the time of the United States' founding, agriculture and small private businesses dominated the economy, and state government left welfare issues to private or local initiative. Laissez-faire ideology was largely abandoned in the 1930s during the Great Depression. Between the 1930s and 1970s, fiscal policy was characterized by the Keynesian consensus, a time during which modern American liberalism dominated economic policy virtually unchallenged. Since the late 1970s and early 1980s, however, laissez-faire ideology, as explained especially by Milton Friedman, has once more become a powerful force in American politics. While the American welfare state expanded more than threefold after World War II, it has been at 20% of GDP since the late 1970s. As of 2014[update] modern American liberalism, and modern American conservatism are engaged in a continuous political battle, characterized by what The Economist describes as "greater divisiveness [and] close, but bitterly fought elections." The modern American political spectrum and the usage of the terms "left–right politics", "liberalism", and "conservatism" in the United States differs from that of the rest of the world. According to American historian Arthur Schlesinger, Jr. (writing in 1956), "Liberalism in the American usage has little in common with the word as used in the politics of any European country, save possibly Britain". Liberalism in Canada also has a similar usage as in the United States. Schlesinger noted that American liberalism does not support classical liberalism's commitment to limited government and laissez-faire economics. Because those two positions are instead generally supported by American conservatives, historian Leo P. Ribuffo noted in 2011, "what Americans now call conservatism much of the world calls liberalism or neoliberalism." In American politics, the Democratic Party is commonly known as the dominant center-left liberal national party, while the smaller Green Party is known for being closer to the progressive anti-capitalist left-wing of modern American politics. The Republican Party is commonly known as the dominant right-wing national party, and the alternative Libertarian Party attracts some independent-leaning voters who tend to be more social liberal on social issues and fiscally conservative on economic policy. The right of suffrage is nearly universal for citizens eighteen years of age and older. All states and the District of Columbia contribute to the electoral vote for President. However, the District, and other U.S. holdings like Puerto Rico and Guam, lack federal representation in Congress. These constituencies do not have the right to choose any political figure outside their respective areas. Each commonwealth, territory, or district can only elect a non-voting delegate to serve in the House of Representatives. Women's suffrage became an important issue after the American Civil War of 1861-65. After the Fifteenth Amendment to the United States Constitution was ratified in 1870, giving African-American men the right to vote, various women's groups wanted the right to vote as well. Two major interest groups formed. The first group was the National Woman Suffrage Association, formed by Susan B. Anthony and Elizabeth Cady Stanton, that wanted to work for suffrage on the federal level and to push for more governmental changes, such as the granting of property rights to married women. The second group, the American Woman Suffrage Association formed by Lucy Stone, aimed to give women the right to vote. In 1890, the two groups merged to form the National American Woman Suffrage Association (NAWSA). The NAWSA then mobilized to obtain support state-by-state, and by 1920, the Nineteenth Amendment to the United States Constitution was ratified, giving women the right to vote. Student activism against the Vietnam War in the 1960s prompted the passage of the Twenty-sixth Amendment to the United States Constitution, which lowered the voting age from twenty-one to eighteen, the legal age of the draft. States governments have the power to make laws that are not granted to the federal government or denied to the states in the U.S. Constitution for all citizens. These include education, family law, contract law, and most crimes. Unlike the federal government, which only has those powers granted to it in the Constitution, a state government has inherent powers allowing it to act unless limited by a provision of the state or national constitution. The United States has 89,500 local governments, including 3,033 counties, 19,492 municipalities, 16,500 townships, 13,000 school districts, and 37,000 other special districts that deal with issues like fire protection. Local governments directly serve the needs of the people, providing everything from police and fire protection to sanitary codes, health regulations, education, public transportation, and housing. Typically local elections are nonpartisan—local activists suspend their party affiliations when campaigning and governing. About 28% of the people live in cities of 100,000 or more population. City governments are chartered by states, and their charters detail the objectives and powers of the municipal government. The United States Constitution only provides for states and territories as subdivisions of the country, and the Supreme Court has accordingly confirmed the supremacy of state sovereignty over municipalities. For most big cities, cooperation with both state and federal organizations is essential to meeting the needs of their residents. Types of city governments vary widely across the nation. However, almost all have a central council, elected by the voters, and an executive officer, assisted by various department heads, to manage the city's affairs. Cities in the West and South usually have nonpartisan local politics. This combines both the legislative and executive functions in one group of officials, usually three or more in number, elected citywide. Each commissioner supervises the work of one or more city departments. Commissioners also set policies and rules by which the city is operated. One is named chairperson of the body and is often called the mayor, although his or her power is equivalent to that of the other commissioners. Fundraising plays a large role in getting a candidate elected to public office. Without money, a candidate may have little chance of achieving their goal. In the 2004 general elections, 95% of House races and 91% of senate races were won by the candidates who spent the most on their campaigns. Attempts to limit the influence of money on American political campaigns dates back to the 1860s. Recently, Congress passed legislation requiring candidates to disclose sources of campaign contributions, how the campaign money is spent, and regulated use of "soft money" contributions. The United States Constitution does not mention political parties, primarily because the Founding Fathers did not intend for American politics to be partisan. In Federalist Papers No. 9 and No. 10, Alexander Hamilton and James Madison, respectively, wrote specifically about the dangers of domestic political factions. In addition, the first President of the United States, George Washington, was not a member of any political party at the time of his election or during his tenure as president. Washington hoped that political parties would not be formed, fearing conflict and stagnation. Nevertheless, the beginnings of the American two-party system emerged from his immediate circle of advisers. Hamilton and Madison ended up being the core leaders in this emerging party system. In modern times, in partisan elections, candidates are nominated by a political party or seek public office as an independent. Each state has significant discretion in deciding how candidates are nominated, and thus eligible to appear on the election ballot. Typically, major party candidates are formally chosen in a party primary or convention, whereas minor party and Independents are required to complete a petitioning process. The modern political party system in the United States is a two-party system dominated by the Democratic Party and the Republican Party. These two parties have won every United States presidential election since 1852 and have controlled the United States Congress since 1856. The Democratic Party generally positions itself as left-of-center in American politics and supports a modern American liberal platform, while the Republican Party generally positions itself as right-wing and supports a modern American conservative platform. Third parties and independent voters have achieved relatively minor representation from time to time at local levels. The Libertarian Party is the largest third party in the country, claiming more than 250,000 registered voters in 2013; it generally positions itself as centrist or radical centrist and supports a classical liberal position. Other contemporary third parties include the left-wing Green Party, supporting Green politics, and the right-wing Constitution Party, supporting paleoconservatism. Various federal and state laws regulate elections. The United States Constitution defines (to a basic extent) how federal elections are held, in Article One and Article Two and various amendments. State law regulates most aspects of electoral law, including primaries, the eligibility of voters (beyond the basic constitutional definition), the running of each state's electoral college, and the running of state and local elections. The result is that American political parties have weak central organizations and little central ideology, except by consensus. A party really cannot prevent a person who disagrees with the majority of positions of the party or actively works against the party's aims from claiming party membership, so long as the voters who choose to vote in the primary elections elect that person. Once in office, an elected official may change parties simply by declaring such intent. An elected official once in office may also act contradictory to many of his or her party's positions (this had led to terms such as "Republican In Name Only"). In the 1850s, the issue of slavery took center stage, with disagreement in particular over the question of whether slavery should be permitted in the country's new territories in the West. The Whig Party straddled the issue and sank to its death after the overwhelming electoral defeat by Franklin Pierce in the 1852 presidential election. Ex-Whigs joined the Know Nothings or the newly formed Republican Party. While the Know Nothing party was short-lived, Republicans would survive the intense politics leading up to the Civil War. The primary Republican policy was that slavery be excluded from all the territories. Just six years later, this new party captured the presidency when Abraham Lincoln won the election of 1860. By then, parties were well established as the country's dominant political organizations, and party allegiance had become an important part of most people's consciousness. Party loyalty was passed from fathers to sons, and party activities, including spectacular campaign events, complete with uniformed marching groups and torchlight parades, were a part of the social life of many communities. Since the 1790s, the country has been run by two major parties, beginning with the Federalist vs. the Democratic-Republicans, then the Whigs vs. the Democrats, and now the Democrats and Republicans. Minor or third political parties appear from time to time and tend to advocate for policies dedicated to a specific issue. At various times the Socialist Party, the Farmer-Labor Party and the Populist Party for a few years had considerable local strength, and then faded away—although in Minnesota, the Farmer–Labor Party merged into the state's Democratic Party, which is now officially known as the Democratic–Farmer–Labor Party. At present, the Libertarian Party is the most successful third party. New York State has a number of additional third parties, who sometimes run their own candidates for office and sometimes nominate the nominees of the two main parties. In the District of Columbia, the D.C. Statehood Green Party has served as a strong third party behind the Democratic Party and Republican Party. One type of private interest group that has grown in number and influence in recent years is the political action committee or PAC. These are independent groups, organized around a single issue or set of issues, which contribute money to political campaigns for U.S. Congress or the presidency. PACs are limited in the amounts they can contribute directly to candidates in federal elections. There are no restrictions, however, on the amounts PACs can spend independently to advocate a point of view or to urge the election of candidates to office. Some views suggest that the political structure of the United States is in many respects an oligarchy, where a small economic elite overwhelmingly determines policy and law. Some academic researchers suggest a drift toward oligarchy has been occurring by way of the influence of corporations, wealthy, and other special interest groups, leaving individual citizens with less impact than economic elites and organized interest groups in the political process. A study by political scientists Martin Gilens (Princeton University) and Benjamin Page (Northwestern University) released in April 2014 suggested that when the preferences of a majority of citizens conflicts with elites, elites tend to prevail. While not characterizing the United States as an "oligarchy" or "plutocracy" outright, Gilens and Page do give weight to the idea of a "civil oligarchy" as used by Jeffrey A. Winters, saying, "Winters has posited a comparative theory of 'Oligarchy,' in which the wealthiest citizens – even in a 'civil oligarchy' like the United States – dominate policy concerning crucial issues of wealth- and income-protection." When a majority of citizens disagrees with economic elites and/or with organized interests, they generally lose. Moreover, because of the strong status quo bias built into the US political system, even when fairly large majorities of Americans favor policy change, they generally do not get it. ... [T]he preferences of the average American appear to have only a minuscule, near-zero, statistically non-significant impact upon public policy. E.J. Dionne Jr. described what he considers the effects of ideological and oligarchical interests on the judiciary. The journalist, columnist, and scholar interprets recent Supreme Court decisions as ones that allow wealthy elites to use economic power to influence political outcomes in their favor. "Thus," Dionne wrote, in speaking about the Supreme Court's McCutcheon et al. v. FEC and Citizens United v. FEC decisions, "has this court conferred on wealthy people the right to give vast sums of money to politicians while undercutting the rights of millions of citizens to cast a ballot." I fear that we may be on the verge of becoming an oligarchic form of society where a handful of billionaires control not just the economy, but the political life of this country. And that's just something we're going to have wrestle with. ^ Samuel P. Huntington (1981). American Politics: The Promise of Disharmony. Harvard University Press. pp. 21–7. ISBN 9780674030213. ^ Cal Jillson (2013). American Government: Political Development and Institutional Change. Taylor & Francis. p. 14. ISBN 9781136875083. ^ Hartz, Louis. The Liberal Tradition in America: An Interpretation of American Political Thought since the Revolution. Orlando: Harcourt, 1955. ^ "Civic Ideals | Yale University Press". yalebooks.com. Retrieved February 21, 2016. ^ "Economist Intelligence Unit. (July 11, 2007). United States: Political Forces". The Economist. Retrieved June 3, 2008. ^ "City Commission". Talgov.com. Retrieved January 29, 2012. ^ "Public Funding of Presidential Elections Brochure". Fec.gov. January 1, 2011. Retrieved January 29, 2012. ^ Mishak, Michael (September 28, 2009). "Recession means there's less money for political campaigns". Las Vegas Sun. Retrieved January 29, 2012. ^ "Internet Revolutionizes Campaign Fundraising". America.gov. July 10, 2008. Archived from the original on May 12, 2009. Retrieved January 29, 2012. ^ "Thirty-Ninth Congress. – Second Session. Senate ... House of Representatives" (PDF). New York Times. March 2, 1867. Retrieved January 29, 2012. ^ Baker, Peter; VandeHei, Jim (November 8, 2006). "A Voter Rebuke For Bush, the War And the Right". Washington Post. Retrieved May 26, 2010. Bush and senior adviser Karl Rove tried to replicate that strategy this fall, hoping to keep the election from becoming a referendum on the president's leadership. ^ "Election '98 Lewinsky factor never materialized". CNN. November 4, 1998. Americans shunned the opportunity to turn Tuesday's midterm elections into a referendum on President Bill Clinton's behavior, dashing Republican hopes of gaining seats in the House and Senate. ^ "Are the Parties Dying?". Democracy Journal. 2018-03-22. Retrieved 2018-09-10. ^ "Third Parties in the U.S. Political Process". PBS NewsHour. Retrieved 2018-09-10. ^ Siegel, Harry; Siegel, Fred (October 7, 2009). "New York's Two-Party System". City-Journal.org. City Journal. Retrieved February 19, 2014. ^ "D.C. BOARD OF ELECTIONS MONTHLY REPORT OF VOTER REGISTRATION STATISTICS" (PDF). District of Columbia Board of Elections and Ethics. December 31, 2013. Retrieved February 19, 2014. ^ "Rhode Island Reapportionment Commission". Archived from the original on October 18, 2007. Retrieved October 18, 2007. CS1 maint: BOT: original-url status unknown (link). ^ "Election 2010: Palm Beach County & Florida Voting, Candidates, Endorsements | The Palm Beach Post". Projects.palmbeachpost.com. Retrieved December 19, 2010. ^ a b Martin Gilens & Benjamin I. Page (2014). "Testing Theories of American Politics: Elites, Interest Groups, and Average Citizens" (PDF). Perspectives on Politics. 12 (3): 564–581. doi:10.1017/S1537592714001595. ^ (French economist Thomas Piketty), Associated Press, December 23, 2017, Q&A: A French economist's grim view of wealth gap, Accessed April 26, 2014, "...The main problem to me is really the proper working of our democratic institutions. It's just not compatible with an extreme sort of oligarchy where 90 percent of the wealth belongs to a very tiny group ..."
^ Alan Wolfe (book reviewer), October 24, 2010, The Washington Post, Review of "The Mendacity of Hope," by Roger D. Hodge, Accessed April 26, 2014, "...Although Hodge devotes a chapter to foreign policy, the main charge he levels against Obama is that, like all politicians in the United States, he serves at the pleasure of a financial oligarchy. ... "
^ Gilens, M. and B.I. Page (2014) "Testing Theories of American Politics: Elites, Interest Groups, and Average Citizens" Perspectives on Politics." Accessed November 6, 2015, "...When the preferences of economic elites and the stands of organized interest groups are controlled for, the preferences of the average American appear to have only a minuscule, near-zero, statistically non-significant impact upon public policy. ... "
^ E.J. Dionne Jr., April 6, 2014, Washington Post, Supreme oligarchy, Accessed April 26, 2014, "...Thus has this court conferred on wealthy people the right to give vast sums of money to politicians while undercutting the rights of millions of citizens to cast a ballot. ... "
^ Bernie Sanders (July 22, 2010). "No To Oligarchy". The Nation. ^ George Galloway (February 27, 2016). "'Clinton & Trump both representatives of oligarchy' - Jill Stein, Green Party presidential candidate". RT. Hansen, Susan B. (January 2016). "Women's equality, candidate difference, and the vote". Journal of Women, Politics & Policy. 37 (1): 47–67. doi:10.1080/1554477X.2016.1116917. 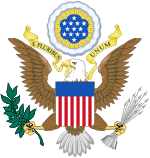 Wikimedia Commons has media related to Politics of the United States.